At least 19 people have died over the last 48 hours due to tornadoes, as a violent system of storms made its way across the South from Mississippi to the Florida Panhandle and parts of Alabama and Georgia. At least 15 people died and around two dozen were injured in Georgia from tornadoes early Sunday morning, following four tornado-related deaths that occurred in Mississippi on Saturday morning. According to the Georgia Emergency Management Agency, four people died in Dougherty County near Albany, seven in Cook County near Adel, and two people died in both Berrien and Brooks counties. After storms ripped through the region overnight, more tornado watches were issued today for the Florida Panhandle and southern Alabama, and the Georgia Emergency Management and Homeland Security Agency has issued a state of emergency for the seven south central Georgia counties impacted by the storm. "The National Weather Service predicts a third wave of severe weather today, which may reach as far north as metro Atlanta. I urge all Georgians to exercise caution and vigilance in order to remain safe and prevent further loss of life or injuries," Nathan Deal, the governor of Georgia, said in a statement. President Trump expressed condolences to the people of Georgia affected by the tornadoes. "I want to start off by telling you I just spoke with Gov. Nathan Deal of Georgia, great state, great people," Trump said. "Florida affected, Alabama affected by the tornadoes, and just expressed our sincere condolences for the lives taken." Trump added that the tornadoes "were vicious and powerful and strong," and said that people suffered as a result of them. "So we'll be helping out the state of Georgia," Trump added. Images on social media showed telephone poles cracked in half. Entire streets looked as if they had been torn apart by the storms. "There are houses just demolished," Norma Ford, a resident of Albany, Georgia, who rushed out with other relatives Sunday evening after hearing a reported twister had overturned her nephew's mobile home, told the Associated Press. Ford told the AP that downed trees and powerlines blocked roads. Many in the region went without power overnight. Michael Miller, coroner in Brooks County, Georgia, told ABC News that two deaths were confirmed in his county with five more fatalities in Cook County and four more in nearby Berrien County. At least 23 other people in the state are injured. 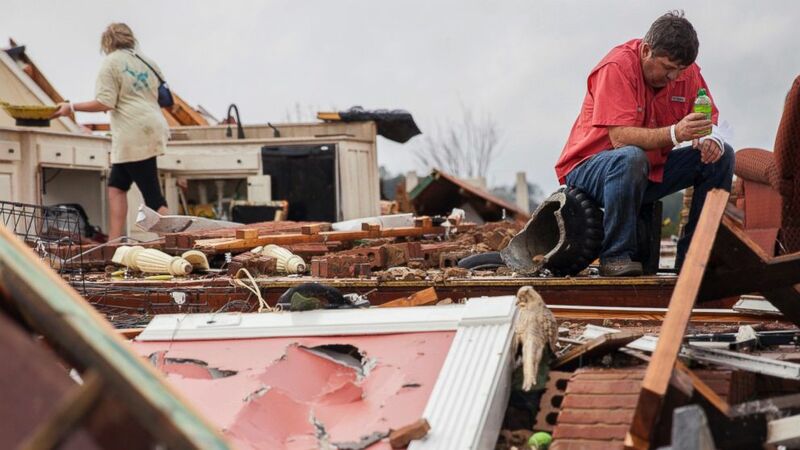 In the area of Hattiesburg, Mississippi, where at least four people died, a large tornado leveled homes and buildings, trapping residents in their homes, authorities said. Further north in Choctaw County, Mississippi, on Saturday at least four people were injured and at least 20 homes damaged from a possible tornado, according to the National Weather Service. ABC News' David Caplan, Brendan Rand and Matt Foster contributed to this report.